Historic reforms to Mexico’s energy markets are driving demand for market pricing data, news and analysis. Global commodity price reporting agency Argus will begin publishing a new daily market report to meet this demand, which will be available to DTN ProphetX subscribers upon request. Argus Mexico Fuel Markets will provide subscribers with a unique look into Mexico’s fast-changing refined products market. The report will initially provide subscribers with delivered prices for gasoline, diesel, blendstocks and LPG, along with news and analysis. The commodity prices, news and analysis published in Argus Mexico Fuel Markets will serve as a valuable reference point for global energy companies seeking to understand Mexico’s refined products market, which is being restructured as a result of sweeping energy reforms signed by President Enrique Peña Nieto in 2013. The reforms revoked the long-held monopoly of state-owned oil company Pemex and for the first time introduced price liberalisation and private competition in all facets of Mexico’s energy industry. Argus is launching Argus Mexico Fuel Markets ahead of a key milestone in Mexico’s retail motor fuel sector: the government is expected to begin removing caps on retail gasoline and diesel prices on 30 March, allowing market forces to set prices. By law, fuel prices in Mexico must be market driven by 1 January 2018. The government has opted for a gradual, region-by-region liberalisation plan, which will be first introduced in the northwestern states of Sonora and Baja California. For information on accessing this report, please contact your Schneider Electric sales representative at: energytradingsales@dtn.com. Sliding from a 1-1/2 year high on the first day of March, the April gasoline futures contract rolled into the nearest delivery position in trading on the New York Mercantile Exchange, signaling the spring transition to more stringent fuel specifications. Known as the Reformulated Blendstock for Oxygenate Blending contract, April RBOB futures rallied to $1.7257 gallon on March 1, the highest trade on the spot continuous chart since mid-August 2015, after settling 21.74cts above the now expired March contract on the last day of February. However, too much gasoline supply and weaker-than-expected gasoline demand in early 2017 pressed the April contract down more than a nickel to settle at $1.6780 gallon on March 1. Gasoline supplied to market in 2017 through February 24 averaged 8.451 million bpd, down a steep 534,000 bpd or 6% compared with a similar timeline in 2016, while also below an 8.5 million bpd five-year average, according to data from the Energy Information Administration. However, the statistic might be overstating the bearishness in consumption when you consider gasoline demand in 2016 reached a record high of 9.35 million bpd, while the current 2017 cumulative average is greater than in 2013 when it was 8.3 million bpd, above 2012’s 8.39 million bpd average, and tops the 2011 average of 8.19 million bpd. Indeed, gasoline demand surged during the first three quarters in 2016 before tapering off in the fourth quarter as retail prices gained sharply. The U.S. retail gasoline average is currently more than 50cts higher than a year ago, reaching $2.314 gallon on February 27 for regular grade according to an EIA survey. Poor weather in California has also been credited in hamstringing gasoline demand in early 2017. 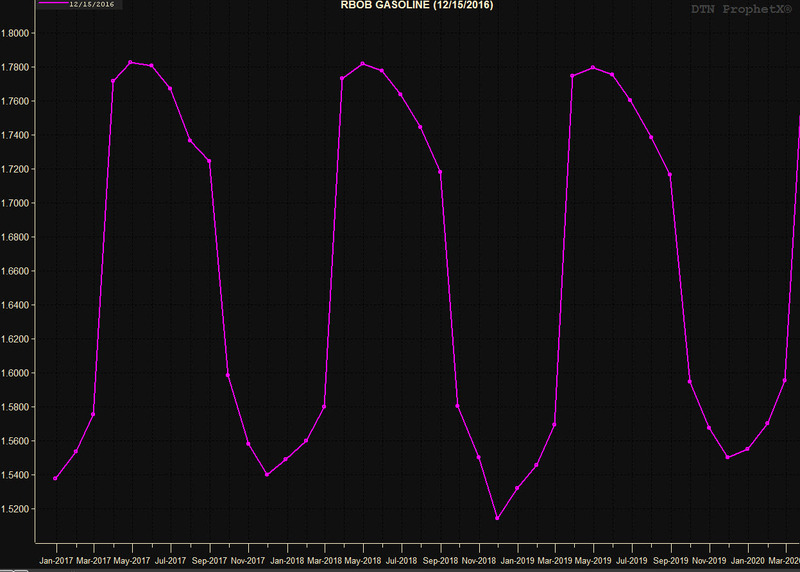 “This YOY declining trend actually began at the end of 2016 and has led to record levels of gasoline in storage and the lowest gasoline margins we have seen in some time. It is also causing refiners to review their operating strategies after running “full out” over the last couple of years to satisfy strong domestic and export demand,” writes Turner, Mason and Company in their most recent John Auers’ Turning Point blog. Commercial gasoline inventory in the United States reached a record high of 259.1 million bbl on February 10, while drawn down roughly 3.2 million bbl over the following two weeks to 255.9 million bbl as of February 24, EIA data shows. Gasoline supply along the PADD 1 East Coast also reached a record high on February 10 of 76.3 million bbl, while down 1.3 million bbl to 75 million bbl on February 24. The high inventory level prompted some tankers ready to offload gasoline in the New York Harbor to be rerouted in February. Analysts note March and April are peak months for unit shutdowns during the spring refinery maintenance season, with those outages set to help pare down the oversupply. Moreover, January and February are historically the weakest months for gasoline consumption, and as the weather warms driving demand will climb. Wholesale prices look vulnerable to the downside in March nonetheless, as talk abounds in the market that some refiners will slash their offers to move out winter grade gasoline to make room for lower Reid vapor pressure product. RBOB futures forward curve through August delivery illustrates the likely cap on wholesale gasoline prices, with the modest contango–a market structure in which nearest delivery is priced at a discount to deferred delivery–at less than 7cts a gallon. August RBOB futures settled at $1.7468 gallon on March 1. Another sign suggesting price weakness, noncommercial traders, also known as speculators since they are not buying a futures contract to hedge an underlying physical position in the market, have consistently reduced their exposure to higher prices since reaching a 10-month net-long high on January 18. 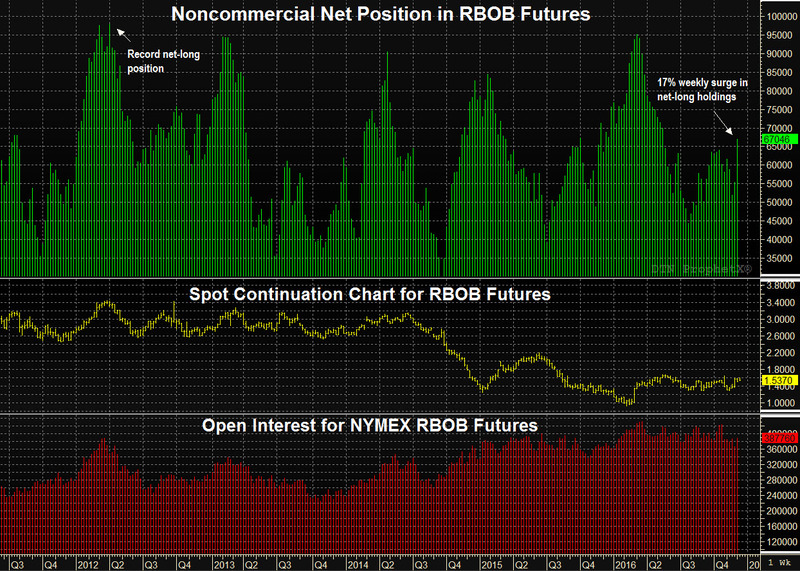 Speculators have liquidated 30,134 or 34% of their long RBOB futures positions since reaching the high to 58,535 contracts as of February 21, the Commodity Futures Trading Commission shows in their weekly Commitment of Traders report, with a long position taken on expectations prices would move higher. 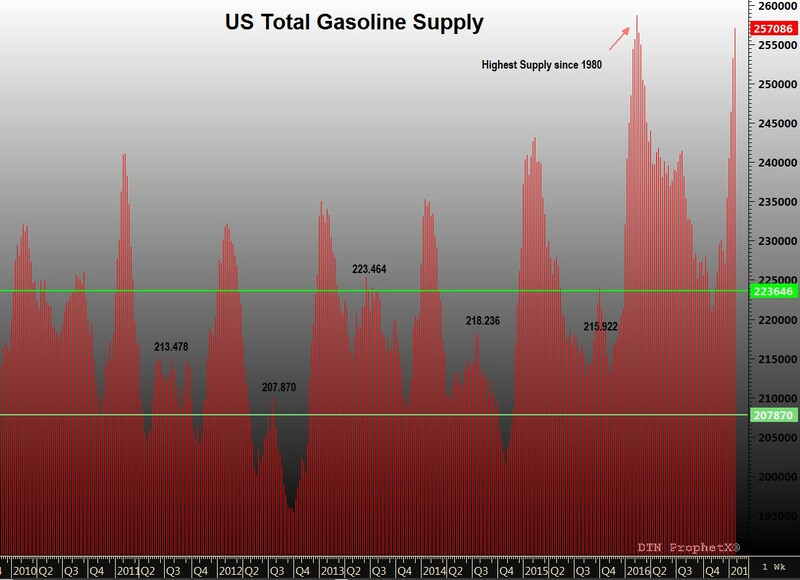 Until the oversupply clears, gasoline prices will be capped. However a robust U.S. economy and ongoing gains in employment could help accelerate the drawdown. The stock market continued its tear, with the Dow Jones Industrial Average rallying through the 21,000 mark for the first time on March 1, and U.S. manufacturing expanded in February, with the Purchasing Manager’s Index climbing a more-than-expected 1.7 points to 57.7 according to the Institute for Supply Management, with readings above 50 indicating expansion. At 4.8% in January, the national unemployment rate is at 10-year low, and the labor participation rate has ticked up 0.3% since Trump won the presidential election to 62.9% in January, although remains near its lowest point in 40 years. The string of positive economic data has enlivened consumer sentiment, with the Conference Board, a private international company, reporting consumer confidence in the United States at a 15-year high in February. These data sets indicate consumers are bullish. To learn more about Schneider Electric’s energy and commodity trading platform, DTN ProphetX click here. The average price for regular grade gasoline sold at retail outlets across the United States reached a six-month high of $2.496 gallon on January 9, a time of year when gasoline prices typically decline, with the previous high of $2.499 gallon registered in June also the 2016 high, data from the Energy Information Administration shows. The average declined over the following three weeks to $2.408 gallon on January 30, although appears positioned to again advance in February. The price action runs contrary to gasoline’s seasonal disposition, with seasonal factors corroborated by bearish fundamentals. EIA data shows the domestic supply of gasoline as of January 27 increased 21.6 million bbl or 9% from end year 2016 to 257.1 million bbl–the second largest inventory holding since record keeping began in 1980, with the high reached in mid-February 2016 at 258.7 million bbl. The building supply came as implied demand–gasoline supplied to the primary market–slumped to a nearly two-year low at 8.039 million bpd despite strong exports. EIA shows US gasoline exports averaged 925,250 bpd in January after reaching a weekly high export rate of 1.149 million bpd during the week-ended December 23. Bearish weekly statistics in January provided some downward pressure, with February gasoline futures traded on the New York Mercantile Exchange testing price support at the $1.4888 gallon 50% retracement point for the November-to-January rally late in the month after reaching a 16-month high on the spot continuous chart at $1.7095 gallon on the first business day of 2017. Still, the February reformulated blendstock for oxygenate blending futures contract on NYMEX expired January 31 at $1.5256 gallon, a value at the upper end of the 2016 summer range for nearest delivered futures and nearly $0.40 gallon higher than year prior. On the first day of February, March RBOB futures settled at $1.5791 gallon as it rolled into the nearest delivered position in the contango market, well above the $0.8975 gallon multiyear low plumbed in February 2016 by nearest delivered futures. The forward curve ended February 1 at a $1.8139 gallon high for May delivery, near flat with the June contract at $1.8105 gallon, and at a slight premium to April delivery at $1.7973 gallon. 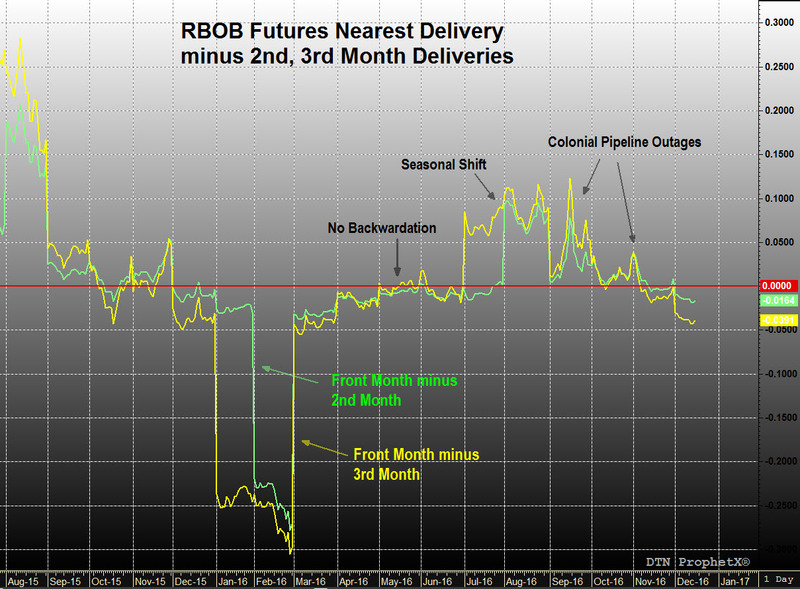 RBOB futures second quarter premium to March delivery coincides with the preseason rally for gasoline, as prices advance from late winter to spring amid the transition to the more costly to produce summer-grade gasoline specifications, seasonal refinery maintenance, and the expectation for greater demand during the warm summer months. 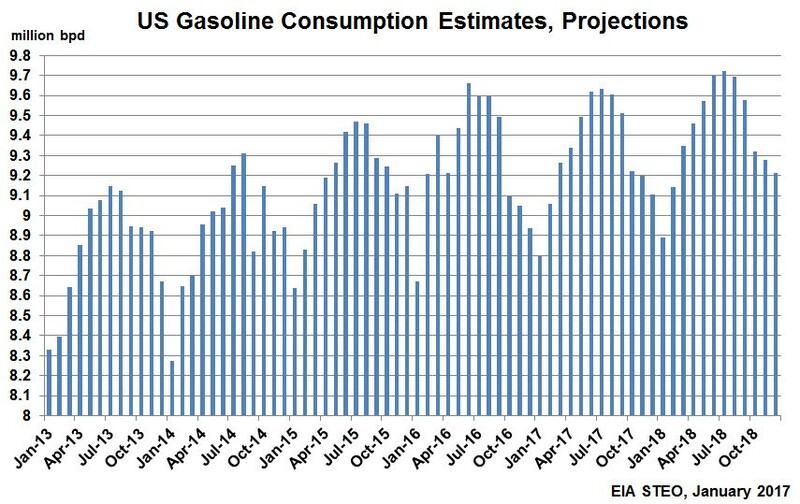 EIA forecasts US gasoline consumption to average 9.62 million bpd from June to August, a tad higher than estimated for the corresponding period in 2016, and well above a projected 9.04 million bpd demand rate for the first quarter. 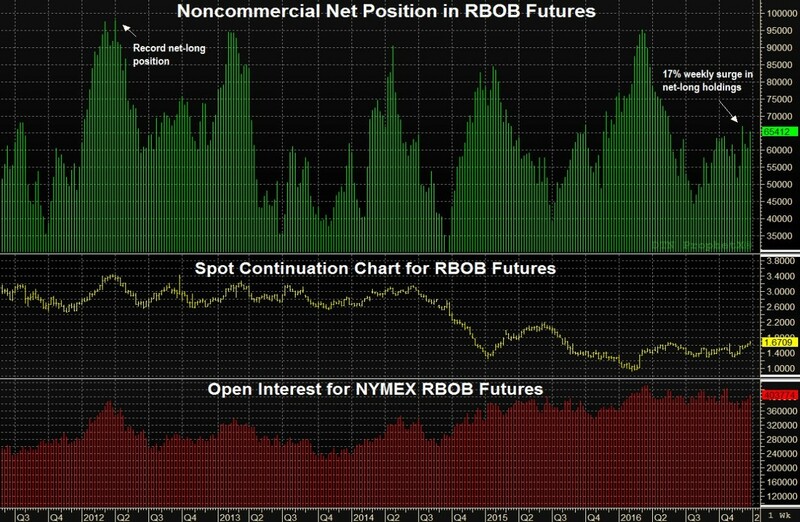 Driving current price strength is bullish sentiment reflected by building length in NYMEX RBOB futures by non-commercial market participants who are speculators since they are not using the futures contract to hedge a physical position in the underlying market. The non-commercial trading group boosted a net-long stance in RBOB futures to a 10-month high in mid-January before paring the position data from the Commodity Futures Trading Commission shows, with a long position taken on an expectation for prices to increase. Open interest for RBOB futures reached a record high in January, with the elevated market participation demonstrated by the outstanding contracts indicating wide support for higher prices. This dovetails with bullish sentiment for West Texas Intermediate futures, with the US crude price benchmark achieving a record high net-long position of 482,523 contracts held by speculators in late January, with the futures position equivalent to 482.523 million bbl of crude oil. Open interest for WTI edged off a record high to 2.15 million outstanding contracts in late January. Production cuts by the Organization of the Petroleum Exporting Countries and 11 non-OPEC producers that took effect January 1 continue to promote the market’s exuberance, with early indications showing strong compliance with the cuts by OPEC. Of the nearly 1.8 million bpd in combined production cuts agreed to by the parties in late 2016, OPEC has agreed to a 1.2 million bpd reduction during the first six months of 2017. OPEC has so far defied its history of cheating on quotas spurring the record length in WTI futures. The International Energy Agency expects the production cuts to erase a global supply-demand imbalance in the second quarter, three years following the start of overproduction which peaked in the second quarter 2016. The large net-long stance leaves the market vulnerable to a steep selloff, and the market will continue to closely scrutinize OPEC production rates to ensure a high level of compliance. So too will market followers look over US production data, which reached a 10-month high in January at 8.961 million bpd as higher crude prices prompt US shale oil producers to finish drilled but uncompleted wells. The EIA reports 5,379 DUC oil and gas wells in December. AS DEMONSTRATED with Brexit, the Columbian peoples’ rejection of a peace accord with FARC and the election of Donald Trump as the 45th President of the United States along with Republican majorities in both chambers of Congress, predicting outcomes is no easy task. With the exception of Republicans holding the House of Representatives, forecasters overwhelmingly predicted the opposite outcome to these stunning elections. Yet price forecasting is a required endeavor for the oil industry, and oil futures are notoriously volatile. Fortunately, the market offers a variety of information that can be captured and studied, and adjustments and corrections can be made to most positions taken in oil futures. As we look into the 2017 horizon, a quick study of key drivers to the price action for West Texas Intermediate futures traded on the New York Mercantile Exchange in 2016 will provide counsel. It was a gloomy market in early 2016, with WTI futures plunging to a $26.05 bbl multi-year low in February, as oversupply swamped futures values. Noncommercial traders held the fewest long positions, a bet prices would move higher, in more than 3-1/2 years. Yet, in less than four months, nearest delivered WTI futures would nearly double, topping $50 bbl in May even as global oversupply persisted. A turnaround in the market’s psychology, aided by historically strong early year gasoline demand was a key factor that rallied WTI futures from winter to late spring. A market follower can capture this data updated weekly by the Commodity Futures Trading Commission in their Commitment of Traders report that can be analyzed with DTN ProphetX software (see screenshots). The market’s psychology is reflected through the disposition of noncommercial traders who are speculating when buying a futures contract since they are not hedging a physical position in the underlying market. The accompanying chart highlights the frequent incongruities between sentiment and fundamentals, with noncommercial traders adding long WTI positions even though domestic commercial inventory continued to build. Commercial crude inventory in the United States was drawn down in the second quarter from a late April peak well above 500 million bbl, according to data from the Energy Information Administration. Nonetheless, supply remained at stubbornly elevated levels despite record high implied gasoline demand in 2016 which peaked in June, said EIA. By mid-July, crude stockpiles were again growing, accelerating long liquidation that pressed nearest delivered WTI futures below $40 bbl in early August. The summer’s bearishness was also reflected in widening WTI calendar spreads that had narrowed by roughly 80% from the early first quarter to the end of the second quarter on expectations demand growth would overtake new supply and gradually whittle down bloated inventory as low market prices took their toll on production activity. Indeed, US crude production dropped to a 26-month low in ending June. However, domestic output edged higher, although sporadically, into the fourth quarter before making substantial gains in November, as WTI futures traded on either side of $50 bbl in October. The contango widened in the summer with the production gains, illustrating bearishness driven by fundamental factors. However, market sentiment again changed in August, and abruptly, as talk by the Organization of the Petroleum Exporting Countries to reinstate a production quota previously jettisoned in 2014 prompted short covering after the mid-summer selloff. For nearly four months, the market was enslaved by what action OPEC would take on production, last cutting their output eight years prior. The market had its qualms that OPEC would actually reach an accord to tighten their production, having failed to act on multiple occasions earlier in the year amid member combativeness, and again unwound long positions. However, a pledge reached in late September in Algiers ended the selloff, and rallied the WTI contract amid renewed bullish sentiment to a 15-month high in October. While ending September with a pledge to reduce production, details on terms, including individual member quotas were to be determined ahead of OPEC’s biannual summit in Vienna on November 30, sparking jockeying among the 14 members for terms that often fulfilled their self-interest. OPEC members pumped at a record production rate of 33.83 million bpd in October, according to the International Energy Agency, casting doubt that the producer group would reach an agreement. The disharmony between word and action soured the market, again triggering long liquidation by noncommercial traders as market sentiment turned bearish, driving nearest delivered WTI futures to a multi-month low in mid-November. As experienced in early August and late September, increasing bearish bets sets the market up for a short covering rally. WTI futures spiked more than 8.5% on November 30 in an initial reaction to an OPEC agreement to cut production by 1.2 million bpd beginning in January 2017. Market sentiment was again turning bullish. As we peer into 2017, the OPEC agreement should provide price support for WTI futures. However, analysts note higher crude values will prompt increased production, notably by US shale oil producers, that diminishes the agreement’s bullishness. That leads us to WTI’s forward curve which remains under $60 bbl for the next several years, as the accompanying chart illustrates. Keep an eye on long-dated deliveries for clues on an evolving shift in sentiment, cutting through the market’s noise with DTN ProphetX. The surprise election of Donald Trump as the 45th President of the United States has sparked concern that the 10-year old Renewable Fuel Standard might come under attack by his administration despite Trump’s repeated comments during his campaign and after his November win that he supports ethanol in US transportation fuel. Ethanol is the primary renewable satisfying the RFS, with biomass-based diesel the second largest contributor in meeting the mandate. The RFS has several nested categories including cellulosic fuel. The renewable industry’s failure in producing enough cellulosic fuel to meet the mandate—or should we assign blame to unrealistic legislators in setting the target too high—has allowed the RFS to come under criticism. The high volume requirement for the renewable fuel nested category, overwhelmingly satisfied by corn-based ethanol, is another area of protest against the RFS. The increasing volume required to satisfy this portion of the RFS can’t be met with E10 alone, a 10% concentration of ethanol in gasoline, while restrictions remain for a higher concentration for conventional fuel vehicles. Meanwhile, flex-fuel vehicles that allow for a variety of higher ethanol blends in gasoline have only modestly added to US ethanol consumption. This reality has triggered adjustments to the statutory volume mandates under the RFS, and also spiked costs for many of the oil refiners that are obligated to meet the mandate through their purchase of Renewable Identification Numbers—the credit used to show compliance with the RFS. RINs, which are generated with the renewable and move through the supply chain with the blendstock, can be separated and sold in the open market. RIN values surged in 2016 in a repeat performance from 2013 when ethanol neared the 10% “blend wall,” prompting the US Environmental Protection Agency to downgrade the volume requirements under the RFS. Biomass-based diesel, primarily biodiesel made from soya oil, fats and grease while renewable diesel volume continues to increase, has largely been shielded from these criticisms. Indeed, biomass-based biodiesel has moved into the breach, covering volume shortfalls in other nested categories to more closely align annual RFS volume obligations issued by the EPA with the statute. On November 23, 2016, EPA, the administer of the RFS, finalized 2017 volume requirements for obligated parties—oil refiners and importers of petroleum-based transportation fuels—that remain below statute level, although above their proposal issued earlier in the year in May. For 2017, the total renewable fuel volume requirement is 19.28 billion gallons, 2.6% above the 18.8 billion gallons proposed in May 2016, while 19.7% less than the 24.0 billion gallons stated in the statute. For biomass-based diesel, the final renewable volume obligation remained as proposed at 2.0 billion gallons and at 2.1 billion gallons for 2018, the only nested category with the RVO determined for 2018. This is well above the 1.0 billion gallons stated in statute that’s the minimum annual RVO for biomass-based diesel since 2012. American Petroleum Institute President and CEO Jack Gerard reiterated the trade association’s position to end the RFS, saying at API’s annual luncheon on January 4 in Washington, DC, “repeal it, or significantly reform it.” He suggested a cap on ethanol content in gasoline at 9.7% which has previously been proposed in the US Congress would satisfy concerns by the oil and gas trade group. API highlighted how the US energy landscape has changed since the current RFS—the first RFS was enacted in 2005— was passed into law as part of the Energy Independence and Security Act, with the United States moving from energy scarcity to a potential position as net-energy exporter. The trade group said US crude oil and natural gas resources are 63% higher than forecast by the Energy Information Administration when the current RFS was passed into law. Demand for refined fuels is also below EIA projections with US gasoline demand 10% lower than what was forecasted 10 years earlier. The price of RINs were volatile in November and December 2016 following the election of Trump, tumbling in mid-November on the uncertainty of what his presidency means to the RFS before rallying in response to the EPA’s finalized 2017 volume requirements and sentiment Trump won’t change the program. However, several of Trump’s nominees for positions in his administration have been critics of the program, triggering selloffs in the RIN market. They include Oklahoma’s Attorney General Scott Pruitt, nominated to head the EPA, an agency he has legally challenged on several occasions. Former Texas Governor Rick Perry who has been nominated as head of the Energy Department, a department he said in 2012 he would eliminate if president during a failed run to win the Republican nomination. In 2008 as the governor of Texas, Perry petitioned the EPA for a 50% waiver of the RFS volume requirements because enacting the full RFS would cause “severe economic harm,” which was denied by the EPA. Trump chose billionaire Carl Icahn to be a special advisor on rationalizing regulations. Icahn, a majority owner of an independent oil refiner, famously opined in an editorial in 2016 that Pablo Escobar, the now deceased Columbian drug lord, would have found speculating in the RIN market more profitable than trafficking cocaine. Independent refiners that lack blending capacity have seen profits evaporate because they must purchase RINs. However, Iowa Governor Terry Branstad, an ardent supporter of the RFS and Trump’s choice to be the US ambassador to China, has said Trump continues to support the RFS, calming the renewable fuels industry to a degree. Adding to the worry for the biodiesel industry is the lapse of a US$1.00 tax credit paid to blend biomass-based diesel into petroleum-based diesel, which expired on the last day of 2016. This credit has been a critical bridge between higher costing biodiesel and petroleum-based diesel, and the uncertainty on whether it would be extended into 2017 greatly limited trading for forward physical deliveries through the later part of 2016. Considering Trump’s plan to close tax loopholes and expectations Republicans, which control both the Senate and the House of Representatives, would rewrite the US tax code there is speculation that this credit won’t be reinstated. If this assessment is correct, spot transactions could remain constrained, although imports would likely decline. Scott Irwin and Darrel Good with the Department of Agricultural and Consumer Economics at the University of Illinois contemplated the “push” for the advanced biofuels nested category within the RFS due to the shortfall in the cellulosic nested category, with the write down greater than for advanced biofuels. In addition to the biomass-based diesel nested category, biodiesel can be counted against the advanced biofuels mandate. EPA set the final demand requirement for advanced biofuels in 2017 at 4.28 billion gallons, 7% above its May 2016 proposal of 4.0 billion gallons, while less than half of the statute’s 9.0 billion gallons for this year. In their analysis under multiple scenarios, Irwin and Good sets implied demand for biomass-based diesel at 3.083 billion wet physical gallons in 2017 that could decline to 2.883 billion gallons in 2018 or increase to as high as 3.363 billion gallons depending on how the Trump administration addresses the RFS. By 2022, the year when volume increases under the RFS end, biomass-based diesel demand could range from 3.316 billion gallons to 4.329 billion gallons. “[W]hile annual production of and consumption of biomass-based diesel and its feedstocks will likely increase substantially by 2022 in order to fulfill the advanced mandate, the magnitude of the increase could vary over a wide range depending on how much of the cellulosic mandate is effectively converted into additional biomass-based diesel mandate,” said Irwin and Good. In their most recent Short-term Energy Outlook, the EIA projects distillate fuel consumption to grow 1.5% to 3.94 million bpd in 2017 after dropping 3% to 3.88 million bpd in 2016 and 1% to 4.0 million bpd in 2015. The projected pickup in demand comes alongside expectations for quicker economic growth in the United States in 2017, with the latest data available from the US Bureau of Economic Analysis estimating a 3.5% annualized growth rate for the US economy in the third quarter 2016—the greatest quarterly expansion in two years. In the United States, growth in diesel demand correlates closely with an expanding economy since diesel is primarily used in commercial and industrial settings. erican Trucking Associations’ advanced seasonally adjusted For-Hire Truck Tonnage Index climbing 5.7% from year prior. “While I think the November gain overstates the strength in the freight markets, I do believe we are seeing some improvement that will continue into 2017. Retail sales are good, the housing market is solid, and the inventory overhang throughout the supply chain is coming down, all of which will help support truck freight volumes in 2017,” said ATA Chief Economist Bob Costello. Trucking serves as a barometer of the US economy, representing 70.1% of tonnage carried by all modes of domestic freight transportation, including manufactured and retail goods. The gasoline futures contract traded on the New York Mercantile Exchange surged 12% in December, with reformulated blendstock for oxygenate blending futures establishing a new calendar year high for 2016 at $1.7038 gallon between the Christmas and New Year’s Day holidays. Gasoline futures outpaced the advance by West Texas Intermediate and ULSD futures in December which both rallied 9%, as bullish sentiment took control of the market. Spurring the market’s bullish psychology were agreements to reduce production by the Organization of the Petroleum Exporting Countries on November 30 joined by a companion pact on December 10 when 11 non-OPEC producing countries also agreed to cut output. Combined, the two agreements call for a 1.758 million bpd cut in production that, if adhered to, would push global oil demand over production midyear, according to several analysts including the International Energy Agency. The agreements took effect January 1 and are for six-month terms, although country commitments call for an average at the quota level to be reached by June, so some production cuts might not start right away. This feature could puzzle analysts during the interim as they scrutinize monthly production data for compliance, likely sparking increased price volatility. 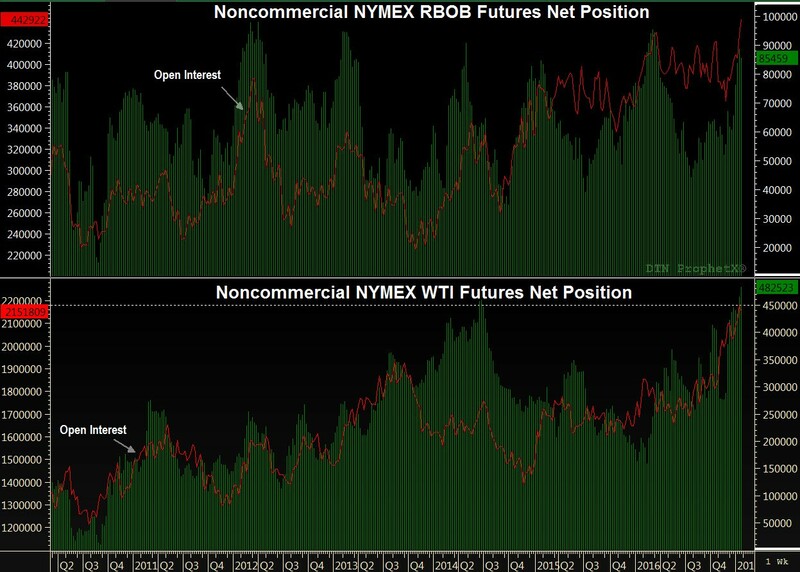 Noncommercial traders, also known as speculators since they are not using a futures contract to underpin a physical position in the underlying market, covered short positions and accumulated long positions in NYMEX RBOB futures in reaction to the November 30 agreement. A long position is taken on expectation prices would move higher over time. A rebalancing market will still need to contend with an abundant quantity of oil in inventory. However, the production cuts would gradually chop down the mountain of supply that has grown over the past couple of years and, in turn, underpin a higher global oil price. This expectation was lent support late in 2016 on a string of data suggesting a quicker expansion of the US economy in 2017, with the Bureau of Economic Analysis in late December reporting a 3.5% annualized growth rate in US gross domestic product for the third quarter 2016–the largest quarterly expansion in two years. Greater economic activity consumes more oil. The US Federal Reserve lifted the federal funds rate in December for only the second time in 10 years on evidence it finds supporting a stronger US economy that, in large part, propelled the US dollar to a 14-year high. Consumer confidence in the United States reached a12-year high in December, with a new administration in Washington, DC, seen creating broader economic opportunity. A confident consumer is willing to spend more of his or her hard earned currency which bodes well for fuel retailers. 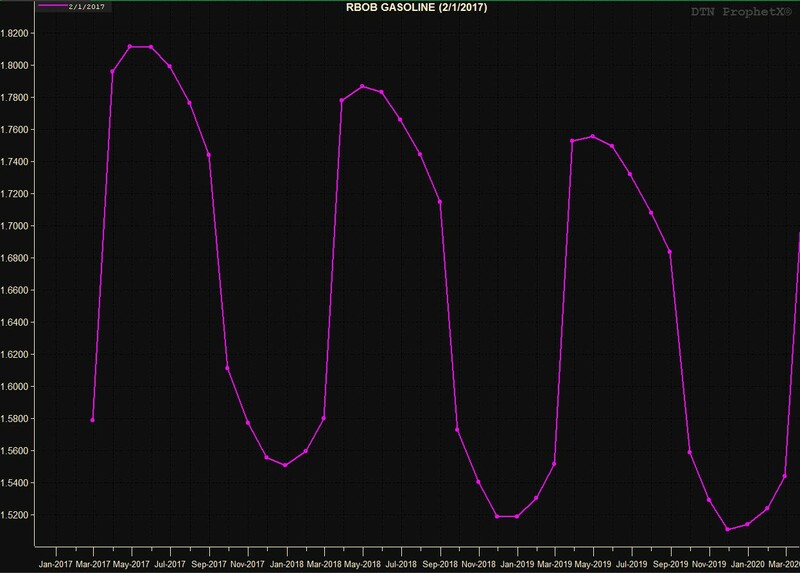 As we look at RBOB futures forward curve, we see an increasing premium built into gasoline prices in early 2017 which reach the mid to upper $1.80 gallon range in April, May and June. Climbing gasoline prices could erect a speed bump to higher sales volume for retailers and suppliers alike in 2017 should demand slow, as witnessed in in late 2016. Although implied gasoline demand set a record high in 2016, demand slowed late in the fourth quarter against the comparable year-ago period as gasoline prices gained. EIA data shows during the four-week period ended December 23, gasoline supplied to market averaged 9.045 million bpd that, while a strong reading, trailed the same four weeks in 2015 by 260,000 bpd or 2.8%. For the year through December 23, implied gasoline demand averaged 9.367 million bpd, up 211,000 bpd or 2.3% against 2015. The US average for regular grade gasoline sold at retail outlets reached a six-month high of $2.364 gallon on December 26, according to EIA data, 32.5cts above year prior. The lower price point in late 2015 was seen incentivizing demand. In a recent note to clients, Tim Evans, futures specialist with Citi Futures, highlighted gasoline demand’s response to prices, saying, a decline in gasoline prices in 2015 lent support to demand with growth up as much as 3.4% in the 12 months ended in September 2015. 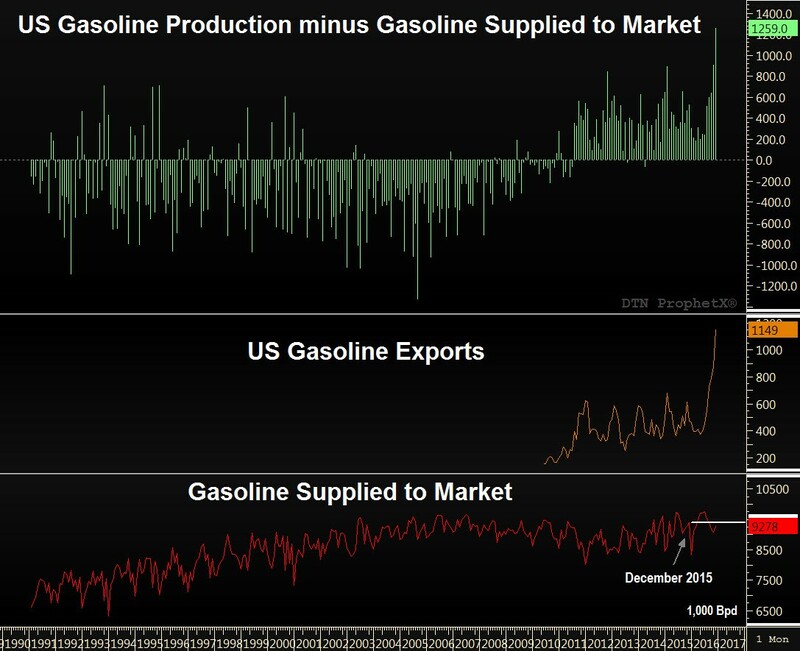 Gasoline exports from the United States, which are included in the products supplied statistic, surged in 2016, reaching a weekly record high of 1.1149 million bpd in late December. Moreover, the trend looks sustainable, as US refineries produce more gasoline than needed by the domestic market amid the country’s oil and gas renaissance. Much of those exports have been shipped to Mexico, where growing domestic consumption joined refinery constraints and outages to spur the demand for US barrels. Mexico is gradually liberalizing its gasoline market, including on imports, which would aid US refineries that are producing well above their historical average. 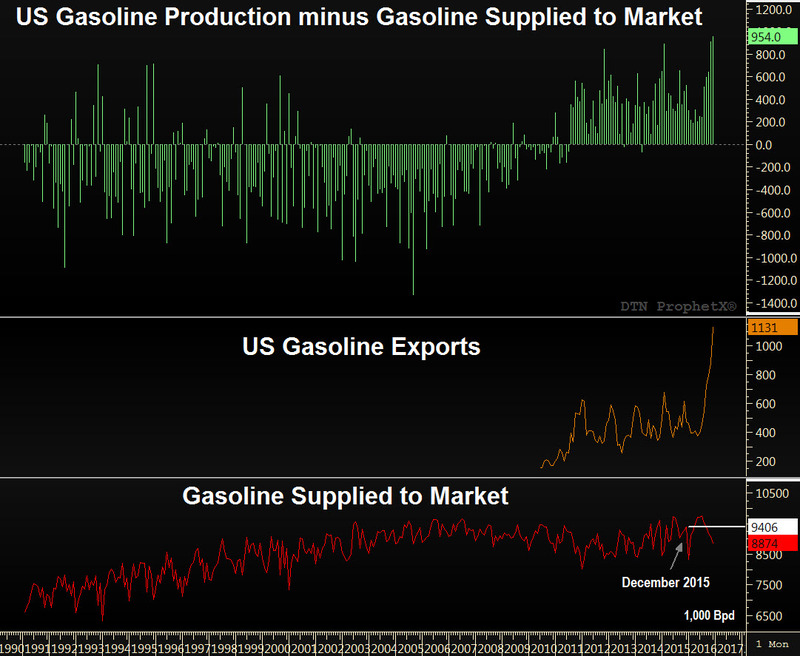 Is the US Gasoline Market Defying the Seasonal Downturn? Gasoline demand in the United States is weakest during the winter months, which Is certainly no surprise considering cold and sometimes hostile weather that limits road travel after the holidays. Yet, despite the seasonal decline in consumption, futures speculators are the most bullish they’ve been in seven months. During the first two weeks of December, nearest delivered reformulated blendstock for oxygenate blending futures traded on the New York Mercantile Exchange settled above $1.50 gallon and at 110% of the $1.3930 2016 average through December 15 every session, putting the value at a spring premium–a time of year when the gasoline contract typically sets the calendar year high. In 2016, the settlement high was established on May 24 at $1.6544 gallon. Gasoline supplied to the primary market, which reached a record weekly high in June and is on pace to set an annual record high in 2016, remains strong late in the fourth quarter. The implied domestic consumption rate has slowed against year prior in late November, early December, when nearest delivered RBOB futures traded roughly 25cts gallon less. The lower price point in late 2015 was seen incentivizing demand. However, while the domestic demand rate has eased from mid-year highs, export demand has grown sharply, offering an outlet for strong production at US refineries. Gasoline export activity expanded in the second and third quarters, data from the Energy Information Administration shows, and surged to a 1.131 million bpd weekly record high in early December. Much of those exports have been shipped to Mexico, where growing domestic consumption joined refinery constraints and outages to spur the demand for US barrels. Mexico is gradually lifting restrictions on imports, with the government to end price controls in northern Mexico in April 2017, which would aid US refineries that are producing well above their historical average. The abundance of US crude oil has been a boon for the US refining sector, boosting margins. The gasoline crack spread, which subtracts the cost of crude from the gasoline price, held below the strong margins experienced in 2015 in 2016, as crude prices advanced relative to gasoline and, in large part, to sharply higher gasoline inventory. Yet, strong gasoline demand and an expected quicker pace of economic growth coupled with an improving US labor market supported a strengthening crack spread in December. Anticipation for a tighter global oil market in 2017 as agreements by the Organization of the Petroleum Exporting Countries and several non-OPEC oil producing countries to reduce production kicks in has also bolstered gasoline values. World crude values crested above $50 bbl early in the fourth quarter as OPEC oil ministers shuttled between member countries to secure commitments for a production cut after two years of global oversupply that had cratered oil prices and decimated many oil-dependent economies. Amid the long courtship, which began in early August, global oil prices rallied and sold off based on the latest newswire headlines and monthly production data until an agreement was reached on November 30 by OPEC and a companion pact on December 10 by several non-OPEC producing nations. Effective January 1, OPEC agreed to cut 1.2 million bpd in their crude production through June 2017 and non-OPEC producers agreed to reduce another 558,000 bpd of output that, if adhered to, is seen balancing the market in 2017. 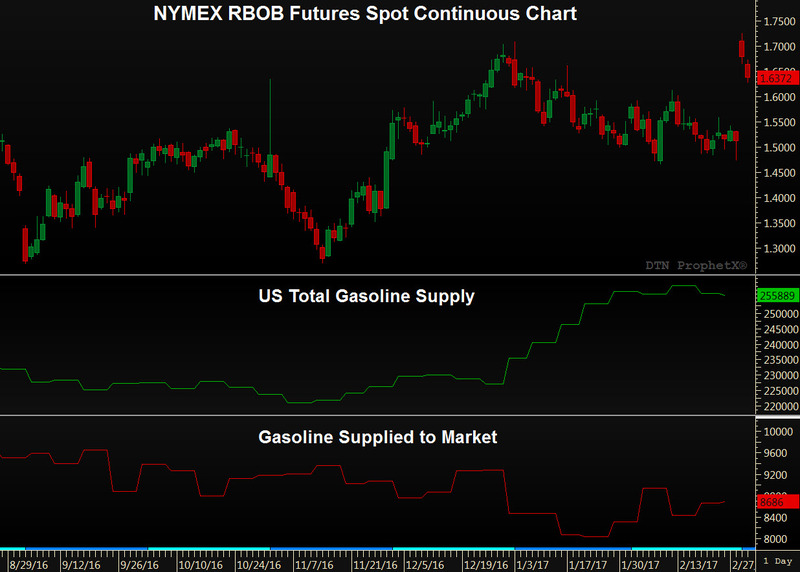 This expectation has turned market sentiment bullish, and not only supports crude prices but also gasoline. 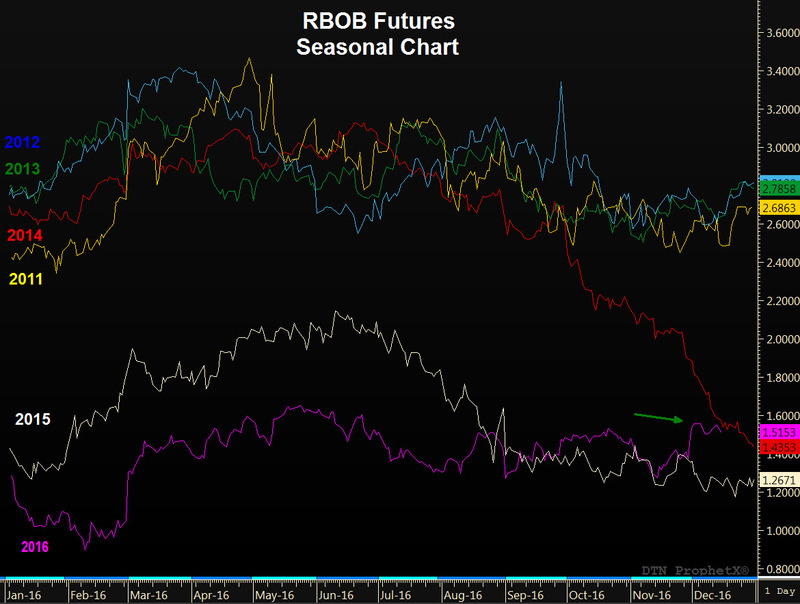 A look at the forward curve suggests RBOB futures will take out the 2016 high on the spot continuous chart in 2017, with the May contract trading just under $1.80 gallon in mid-December. While this explains the spring-like premium in December gasoline prices, it doesn’t mean seasonal features have disappeared. The market is in contango through May 2017, a market structure in which nearest delivered futures trade at a discount to deferred delivery, which is consistent with gasoline’s seasonal cycles. 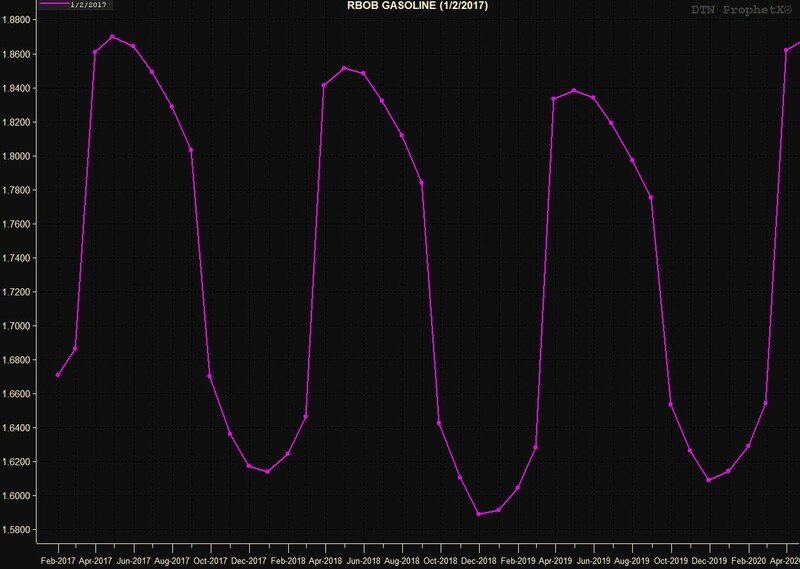 Moreover, the discounts in the calendar spreads at the front end of the forward curve are widening, illustrating gasoline’s weakest season during the first quarter. There are times when the seasonal pattern fails to materialize, which happened in the second quarter 2016 when the front end of the forward curve failed to move into backwardation, a market structure in which futures nearest to delivery trade at a premium to deferred delivery. An oversupplied gasoline market, especially along the East Coast, tamped down the typical summer premium in nearest delivered futures. A modest backwardation compared with historical spreads in contracts nearest to delivery didn’t take hold until late in the driving season when summer contracts moved into a premium against fall delivery. The front end of the curve again widen in September and briefly in early November amid the outages on the Colonial Pipeline’s main gasoline line. The January reformulated blendstock for oxygenate blending futures contract on the New York Mercantile Exchange settled at a better than five-month high on the spot continuous chart in concluding its first session as nearest delivery on December 1, continuing a midweek rally ignited by an historic agreement by the Organization of the Petroleum Exporting Countries (OPEC). After two sessions, which included the expiration of the December RBOB contract on November 30, nearest delivered gasoline futures had rallied 16.99cts or 12.3% to $1.5470 gallon. The previous high settlement on the spot continuous chart was reached during the summer driving season on June 23 at $1.6035 gallon, less than 10 days after US gasoline demand reached a weekly record high of 9.815 million bpd, per data from the Energy Information Administration. During their biannual meeting in Vienna on November 30, OPEC agreed to a 1.2 million bpd cut in their production to 32.5 million bpd that takes effect January 1, with the agreement creating a surge in futures trading. The Chicago-based CME Group reported single-day volume traded in Energy-Complex products on November 30 at a record high 4,510,408, well above the previous record of 3,932,201 contracts on February 11. NYMEX West Texas Intermediate futures volume spiked to 2,530,530 contracts, soaring past the prior record of 1,861,909 contracts set the day following the presidential election on November 9. WTI futures with nearest delivery topped $50 bbl for the first time in nearly six weeks on December 1, rallying $5.82 or 12.9% in two sessions to a $51.06 bbl settlement, and could test resistance near $60 bbl in the coming weeks. Volatility in oil futures is expected to increase further following the OPEC agreement, which cuts production for the first time in eight years. OPEC expects another 600,000 bpd in production cuts from non-OPEC members, with Russia reportedly agreeing to reduce output by 300,000 bpd. The quota agreement has a six-month term, with OPEC to review its affect and market conditions in May 2017. The market will closely watch OPEC members for cheating, with the cartel having a checkered past in complying with quotas. Also, the 32.5 million bpd production quota, the low end of a pledge made by members in Algiers on September 28, doesn’t include Indonesia, which suspended its membership, so the production cut is less dramatic than the headline number. Secondary sources report Indonesia produced 722,000 bpd of crude oil in October. The agreement is nonetheless significant and seen aided by strong growth in oil demand from the United States. However, the upside in crude values is also expected to be limited, given ongoing excesses in global oil supply, with US commercial crude inventory at 488.1 million bbl on November 25, 30.9 million bbl or 6.8% more than the comparable year ago period, data from the EIA shows. Moreover, US shale oil producers whom have already been reactivating rigs that helped boost domestic production to an 8.699 million bpd 5-1/2 month high during the Thanksgiving Day holiday week and 271,000 bpd above a 26-month low plumbed in the final days of the second quarter, are seen as benefactors of OPEC’s cut. Many more wells are seen economical with WTI at $55 to $60 bbl that would add oil to the market and slow the draw down in bloated inventory. Gasoline economics are healthy in the United States amid ample crude supply and strong demand both domestically and for exports. Statistics from the EIA for September, the most recent monthly data available, shows U.S. refinery and blender net production of finished gasoline was 10.3 million bpd in September, 303,000 bpd above a year ago. “Refinery output remains strong even in the late fall; the first two weeks of November had a net output of 10.5 million b/d and 10.2 million b/d, respectively, compared with output of 9.7 million b/d and 9.6 million b/d for the same weeks last year,” said EIA in a weekly report November 30. After nearly 11 months, gasoline supplied to the primary market has averaged 9.394 million bpd, 250,000 bpd or 2.7% above the corresponding period in 2015. EIA shows gasoline exports averaged 564,000 bpd in September, up 208,000 bpd from September 2015, with 60% of the country’s gasoline exports that month sent to Mexico. Another dynamic in a busy November for the oil market was an increase in the required amount of renewables in the transportation sector from a May proposal. On November 23, the Environmental Protection Agency finalized the 2017 Renewable Volume Obligation for the nested renewable fuel category which is overwhelmingly satisfied by conventional corn-based ethanol at the 15 billion gallon statutory level, 200 million gallons more than proposed in May. Tradable D6 Renewable Identification Numbers, credits obligated parties under the Renewable Fuel Standard–refiners, importers and blenders–submit to the EPA to show compliance again spiked above $1, surging nearly 30cts or 38% from a mid-November low to $1.07 on December 1. The blend wall, which refers to the 10% maximum ethanol content level in gasoline that can be used in all vehicles on US roads, remains an impediment in adding more ethanol to the gasoline pool even as the mandate to do so expands, spiking RIN values. In a November 28 blog from consulting engineers Turner, Mason & Company, they project ethanol in the gasoline pool at 14.771 million gallon or 10.18% in 2016 compared to 13.59 million gallons or 10.16% in 2012. “The percentage of ethanol in the gasoline pool has stayed remarkably constant over the past five years. The general conclusion is that the blend wall is still a limitation and demand for E15 and E85 has not grown significantly,” explain the consultants. The higher cost of biodiesel compared with petroleum-based diesel fuel, especially in the third year of low global crude oil prices, requires a bridge to incentivize demand, and for several years the biodiesel industry in the United States has had those incentives amid multiple government programs. Indeed, the US biodiesel industry ratcheted up production from 20 million gallons in 2003 to 2.1 billion gallons in 2015, according to the National Biodiesel Board, with an increasing amount of output, 24.5% of the 2015 total, renewable diesel. NBB, the industry’s national trade organization also reports 2.1 billion gallons of biodiesel was used in the United States in 2015. 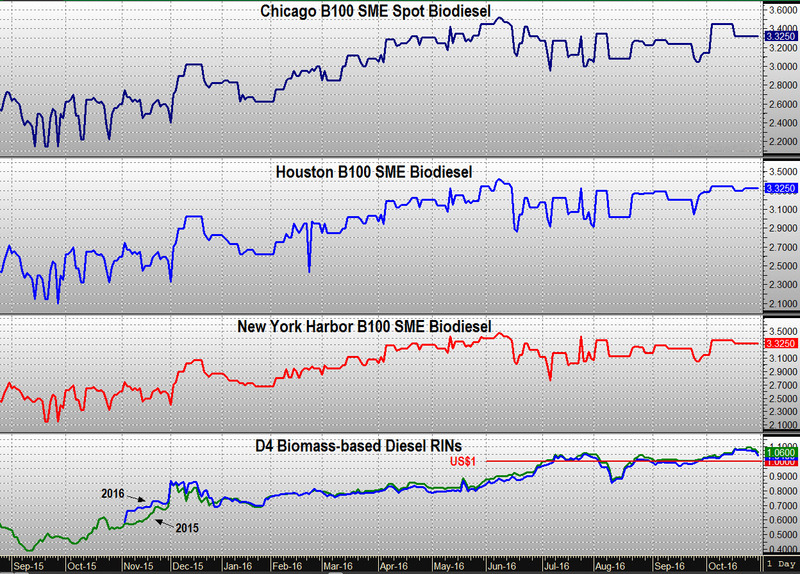 The US biodiesel industry is an exceptional growth story, but also a challenging one that has seen a large number of bankruptcies, and frustrated traders too, when federal programs lapse or lack clear direction on how they will be implemented. These waiting games have pushed otherwise promising companies that lack protracted financial durability out of business or into distressed sales. Indeed, the industry continues to consolidate that defines its maturing status as much as it demonstrates the risk in government dependence. In early November, and deep in the shadows of an extraordinarily contentious US presidential race, the US biodiesel industry awaits the finalized mandate for renewable fuel demand for 2017, and the renewal of a tax incentive to encourage blending. Even as clarity is sought on these two programs, a stream of news releases from the US Department of Justice highlights the fraud seemingly endemic in government programs, and so frequently twinned with unintended consequences. The US Environmental Protection Agency appears to be on target in meeting its end of November deadline in issuing the volume obligation for renewable fuels under the Renewable Fuel Standard for 2017, having submitted their finalized Renewable Volume Obligation to the White House Office of Management and Budget in mid-October. OMB reviews such government diktats to ensure conformity with the administration’s goals and policies. The law establishing the current mandate, which is known as RFS2, lists the volume of renewables obligated parties must use every year, which vary across several nested categories of renewables, and increase annually through 2022. However, the EPA, the administrator of the RFS, must review the market to ensure there will be enough supply to meet the mandate, and that pushing this supply into the market doesn’t cause serious harm to the economy or environment. The legislated mandate for 2017 is that 24.0 billion gallons of renewables in five categories of varying quantities are used in lieu of petroleum-based products, although the EPA proposal released in the spring at 18.8 billion gallons is well below the target due to an inadequate supply of cellulosic fuels and limited space in the gasoline pool based on current fuel specifications, auto manufacturer restrictions and consumer choice. Of that 18.8 billion gallons, biomass-based diesel fuel accounts for 2.0 billion gallons, with biodiesel also able to satisfy the advanced biofuel mandate proposed for 2017 at 1.68 billion gallons. Oil refiners and importers must meet their RVO, whether through blending or in buying a compliance credit in the market known as a Renewable Identification Number. RINs vary in inherent value based on the renewable they were generated by, with D4 RINs satisfying the biomass-based diesel nested category trading over $1 gallon from late September through the full month of October. A finalized RVO above the proposal would likely trigger a higher RIN value in response in December, with RIN valuations seen climbing in 2017 as obligated parties struggle to squeeze more ethanol into the US gasoline pool. The RIN is a critical component in a producer’s income stream. Since a RIN can be separated from the renewable as it moves through the supply chain and sold in an open market, speculators have done the math and have squeezed RIN prices higher, knowing the RIN market will continue to tighten. There’s also been a considerable amount of fraud around the RIN program that have caused harm to obligated parties amid the EPA’s buyer beware policy. Doug Parker, president of E&W Strategies and a former Director of EPA’s Criminal Investigation Division who oversaw investigations into the Deepwater Horizon disaster and Volkswagen’s defeat device fraud case among others, said current RFS-related fraud cases reflect $271 million in documented fraud and another $71 million in seizures of illicit profits. “In my experience this represents a fraction of the actual overall fraud impact, and significantly larger losses will be formally identified in upcoming court filings,” said Parker in a white paper issued early September commissioned by Valero Corporation. RINs associated with the fraud will be retired, and parties that bought those RINs will be forced back into the market to reacquire a compliance credit, further tightening the RIN market. A tax credit that pays $1 per gallon for blending biodiesel into a petroleum-based fuel known as the blender’s credit expires at year’s end, and has stymied forward term transactions for biodiesel because of the uncertainty in knowing whether the credit will be passed by the US Congress for another year or more. The tax credit has been allowed to expire four times over the past 10 years, and has been made retroactive at times, creating windfall profits, yet the uncertainty has challenged business planning and trading activity. A bitterly divided Congress adds another layer of concern that the tax credit will again be extended, and in what form. The blender’s credit has been criticized since imports can also qualify for the tax subsidy with one estimate forecasting US biodiesel imports would reach 800 million gallons this year. There have been calls to move the credit from the blending level to producers. A bill to extend the credit, H.R. 5994: Biodiesel and Renewable Diesel Incentive Extension Act of 2016, was assigned to a committee in mid-September that will consider sending it to the House or Senate for a vote. PredictGov gives the bill a 1% chance of being enacted. 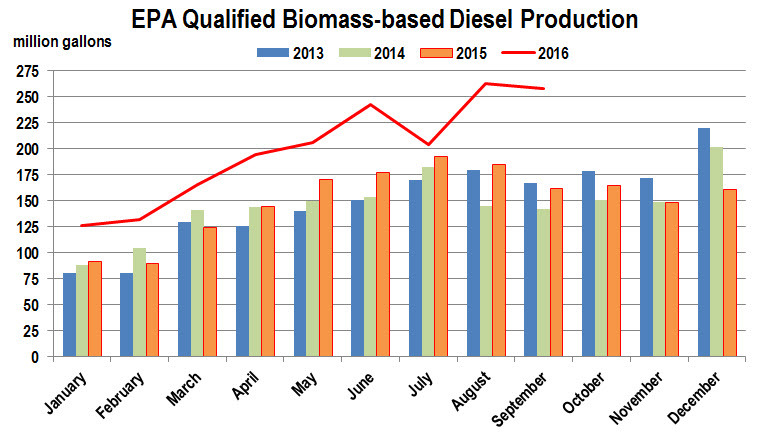 Producers ramped up production in August and September, with EPA qualified biomass-based diesel output at 1.79 billion gallons for the first three quarters of 2016, which compares with 1.81 billion gallons for all of 2015 when you strip out renewable diesel. Renewable diesel uses the same feedstocks as biodiesel but employs a different technology. Spot transactions for biodiesel remain limited early in the fourth quarter, but when completed are primarily transacted in a differential against the ULSD (ultra-low sulfur diesel fuel) futures contract that trades on the New York Mercantile Exchange. 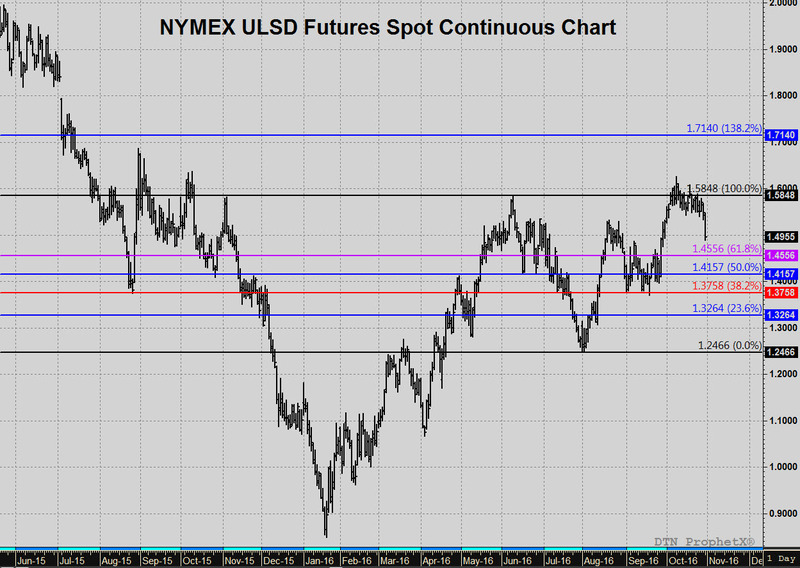 After a rally from September lows into October, ULSD futures were range bound until a selloff in closing out the month. Our easy to use, complete trading solutions provide commodity and energy futures traders with an array of innovative productivity features, advanced analytics, and performance enhancements.